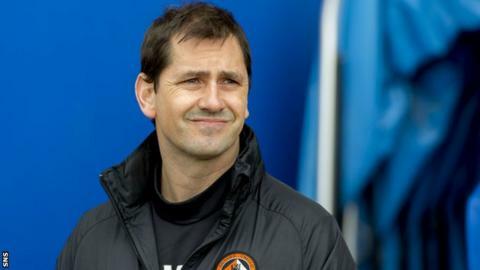 Dundee United have withdrawn their appeal against a touchline ban handed out to manager Jackie McNamara. The Scottish FA gave McNamara a five-match ban, two of those suspended, after a confrontation with St Johnstone counterpart Tommy Wright on 12 March. United's appeal allowed the 40-year-old to sit in the dugout for their Scottish Cup semi-final victory over Rangers. But they say they have withdrawn the appeal "following telephone advice to the Scottish FA earlier this week". "We firmly believe that there are solid grounds to appeal the sentence imposed," said a statement on the club website. "However, having given the matter further thought and as no hearing date has yet been fixed, we now believe it is in the best interests of all concerned to accept the sentence imposed and withdraw the appeal." There had been fears that McNamara could find himself banned from the dugout for the Scottish Cup final against St Johnstone should the appeal process drag on. United only have five Scottish Premiership matches left before the Celtic Park showpiece. McNamara and Wright had a heated exchange after a challenge by St Johnstone's Tim Clancy on Ryan Gauld went unpunished, resulting in both managers being sent to the stand by referee Crawford Allan. Wright received a one-match ban, suspended until the end of 2014, but it was McNamara's third breach of disciplinary rule 203 in three seasons.